Crossword puzzles is a healthy learning fun for kids and adults alike. It tests ability to think and create meaningful words by filling missing alphabets in series of words or phrases. If you are stuck at forming correct word while trying to solve Crossword puzzle, get that magic word (& do some cheating) online at Wolfram Alpha. 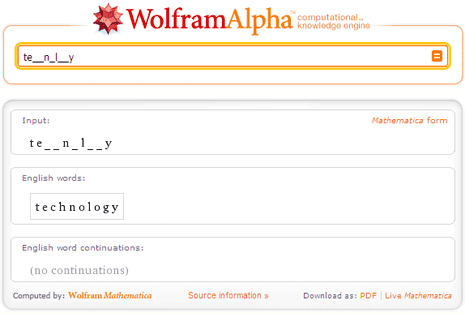 Open Wolfram Alpha and enter your crossword puzzle. Write _ (underscore) for every blank space character in the word your are trying to form. For example type: te_ _n_l_ _y and hit the enter key to see correct word Technology. Similarly you can discover words and complete your crossword puzzle. Checkout Wolfram Alpha to solve crosswords puzzles on the fly and ample cheating, like it?